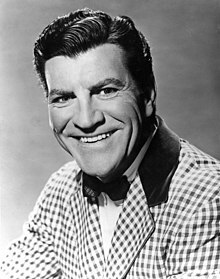 Robert Preston (June 8, 1918 – March 21, 1987) was an American stage and film actor best remembered for originating the role of Professor Harold Hill in the 1957 musical The Music Man and the 1962 film adaptation; the film earned him his first of two Golden Globe Award nominations. Preston collaborated twice with filmmaker Blake Edwards, first in S.O.B. (1981) and again in Victor Victoria (1982). For portraying Carroll "Toddy" Todd in the latter, he was nominated for the Academy Award for Best Supporting Actor at the 55th Academy Awards. Preston was born Robert Preston Meservey in Newton, Massachusetts, the son of Ruth L. (née Rea; 1895-1973) and Frank Wesley Meservey (1899–1996), a garment worker and a billing clerk for American Express respectively. After attending Abraham Lincoln High School in Los Angeles, he studied acting at the Pasadena Community Playhouse. Following the attack on Pearl Harbor and the United States' entry into World War II, he joined the United States Army Air Forces and served as an intelligence officer in the U.S. 9th Air Force with the 386th Bomb Group (Medium). At the end of the war in Europe, the 386th and Captain Robert Meservey, an S-2 Officer (intelligence), were stationed in St. Trond, Belgium. Meservey's job had been receiving intelligence reports from 9th Air Force headquarters and briefing the bomber crews on what to expect in accomplishing their missions. When he began appearing in films, the studio ordered Meservey to stop using his actual family name. As Robert Preston, the name by which he would be known for his entire professional career, he appeared in many Hollywood films, predominantly Westerns but not exclusively. He was "Digby Geste" in the sound remake of Beau Geste (1939) with Gary Cooper and Ray Milland, and featured in North West Mounted Police (1940), also with "Coop". He played an LAPD detective in the noir This Gun for Hire (1942).